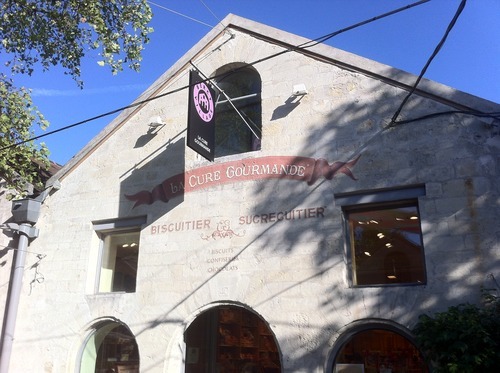 FIRST STOP: Bercy Village – M 14 Cour Saint-Émilion. 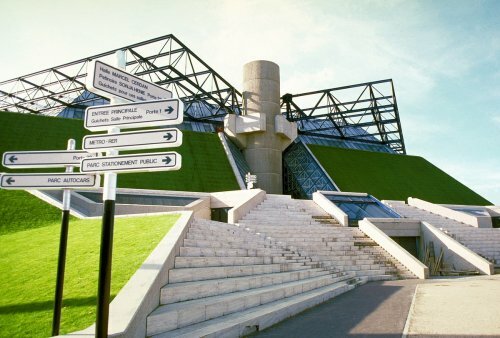 Walk through the Parc de Bercy, opposite the subway station, where you’ll see vines growing. Here is a large lawn laid out in a grid with square rose, herb and vegetable plots, an orchard, and gardens representing the four seasons. 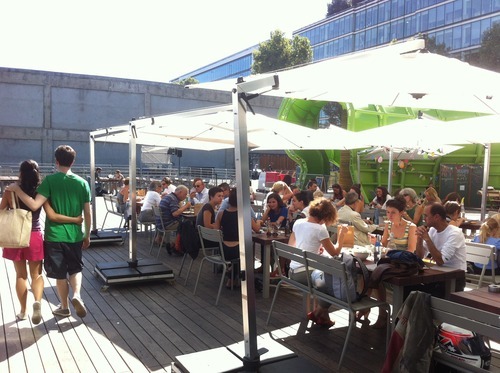 By now you’ll need a pitstop at Cinquante et un, a lovely terrace at the footstep of Frank Gehry’s spacious cubist building. 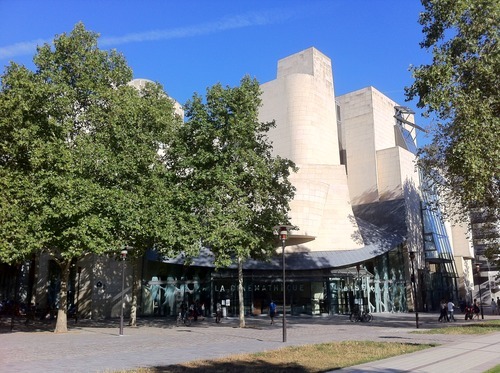 There’s always plenty to see inside: alongside the restaurant, the Cinémathèque Française now boasts four screens, a bookshop, exhibition space and the Musée du Cinéma, where it displays a fraction of its huge collection of movie memorabilia. In the spirit of founder Henri Langlois, the Cinémathèque hosts retrospectives, cult movies, classics, experimental cinema and Q&A sessions. 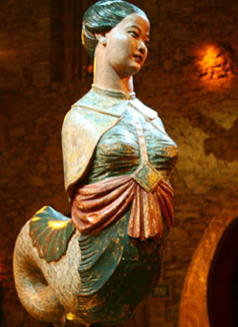 Check the exhibition when you go – we’ve had Tim Burton and in October Les Enfants du Paradis followed by Jacques Demy (Les Demoiselles de Rochefort). 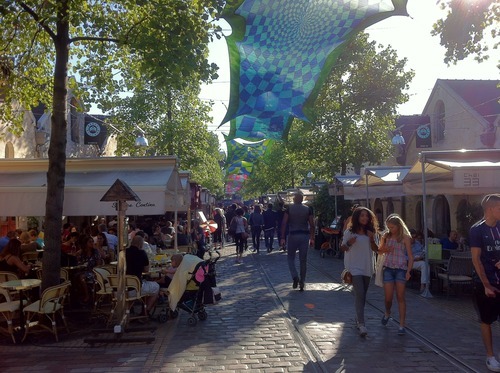 Definitely one of my favourite places in Paris! 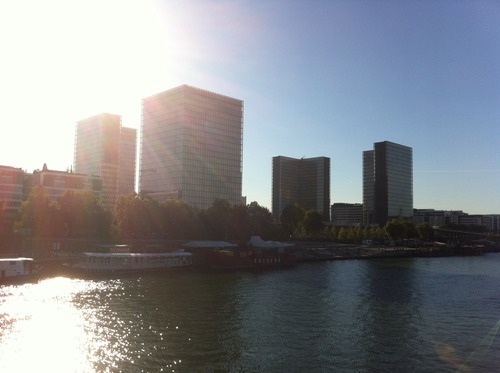 It’s now time to make your way to the other side of La Seine, leaping from the 12th to the 13th arrondisement. 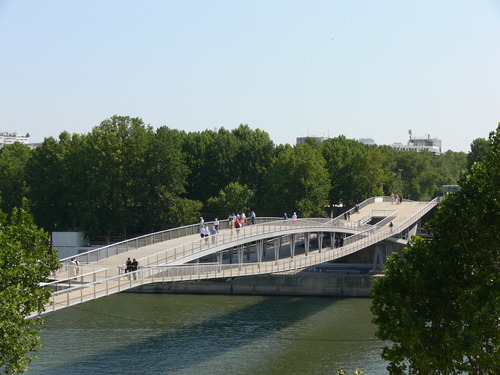 Walk the 2006 passerelle Simone de Beauvoir that leads you straight to The BnF or Bibliothèque François Mitterand (1989), our THIRD STOP. Access is free but you might want to simply burrow into the forest nested in the heart of the 4 towers (79 meters high) and relax. 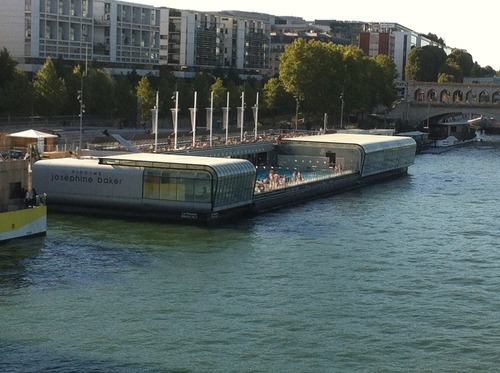 Down on the docks on your right you can see the outdoor swimming-pool Josephine Baker which has one of the best solariums in Paris. 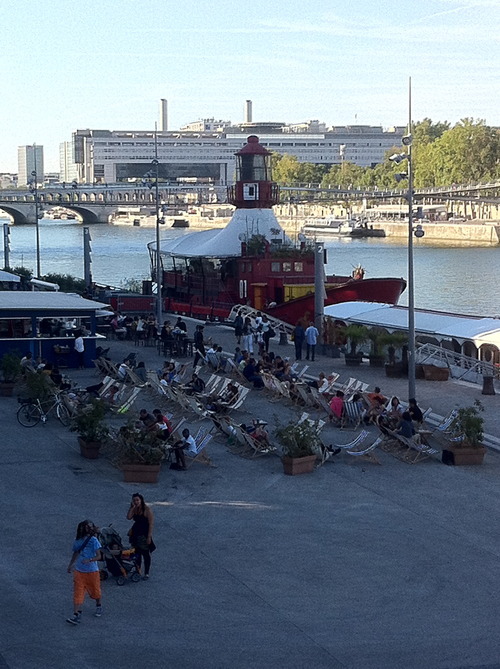 Alongside are several boats (péniche) turned into bars and restaurants, my fave being the red one on the left: le Bateau Phare, famous in the 90s for throwing secret underground parties. 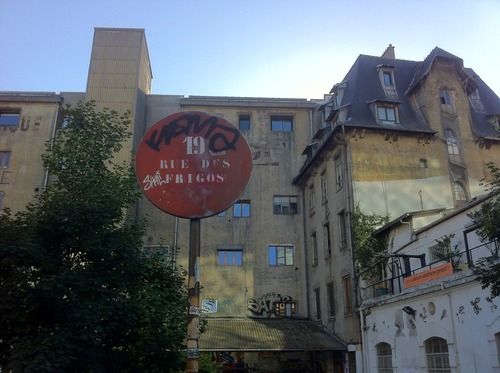 This tour wouldn’t be complete without a visit to the old heart of the 13th arrondissement: les Frigos, 19 rue des Frigos. Only 5 minutes’ walk from the library, and the last remaining derelict building of this evolving neighborhood. It used to be Paris’ grand fridge until the sixties when artists took over to squat it in the eighties. 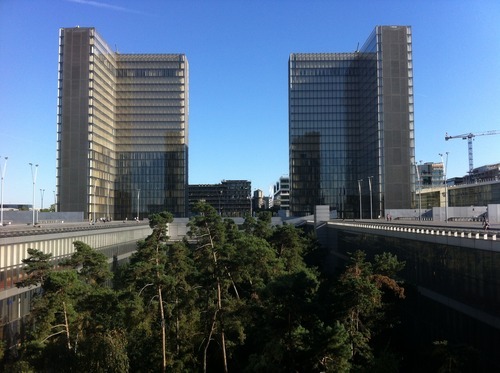 It’s now regulated but still an important creative base for many artists gathered under the name Paris Rive Gauche. 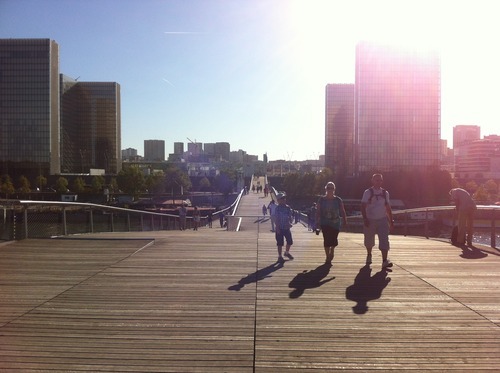 Grab a Velib or walk on the docks to reach our final destination: Docks en Seine – Cité de la Mode et du Design. 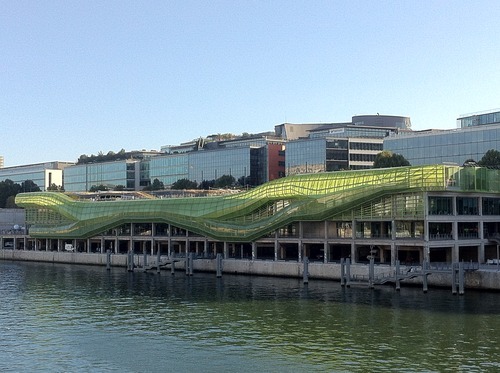 This glass and metal apple-green caterpillar has been pupating on the banks of the river since 2005, awaiting its tenant, the famous fashion school Institut Français de la Mode. It finally opened its doors last spring, transforming an industrial wasteland into a futuristic vision of culture and entertainment as imagined by architects Dominique Jakob and Brendan MacFarlane a long 7 years ago. A grassy terrace runs down to the water, with a bar/club/restaurant (Wanderlust, by the team behind David Lynch’s club Le Silencio and chef Benjamin Darnaud). 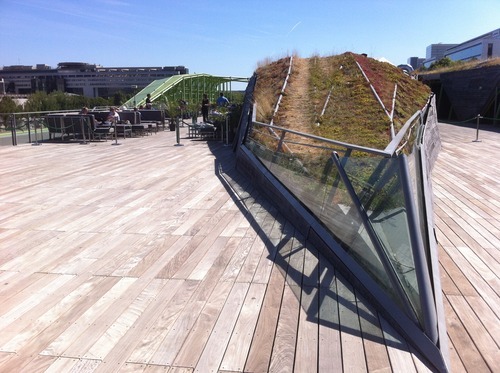 On the first floor here are open-air screenings and fashion exhibitions (Balenciaga and Comme des Garçons exhibitions run until Oct.7th) and a restaurant on the roof (MoonRoof, N.B. awful service, don’t go). The Terrace is spectacular though and to complete this ressurection, Le Baron team is due to open a new club up there in February 2013.